Fallout 4 will be the first game in the series with fully-developed romances, but it was almost the second. Last weekend during PAX I spoke with Josh Sawyer, who served as lead designer on New Vegas and remains a project director at Obsidian. We chatted about the first post-release content for Pillars of Eternity, The White March (Obsidian also talked about the development and future of Pillars in its PAX panel). We spoke about the possibility of an Alpha Protocol-style spy RPG set in the Archer universe, which Sawyer thinks would be a good fit. But mostly we talked about Fallout, and what Sawyer, as one of the creators behind the most beloved Fallout game to date thought about Fallout 4's E3 reveal. Sawyer says he hasn't played Fallout 4 ("I've only seen what everyone else has seen"), but as an RPG fan, he says he's interested in how choice is going to be handled in Fallout 4. "The thing that most surprised me was hearing a voiced protagonist, because that's never been a part of Fallout, really," said Sawyer. "I'm also interested in how they're going do choice and consequence and how the story's going to flow." "We actually had some ideas for characters that would... like in one story draft we had, Cass would get drunk with the protagonist and then would wake up with The King having married them at The King's School of Impersonation. That seemed very Vegas, but we were also like, that's kind of a complicated series of events, so we decided not to do it. But it's also in the vein of the Fallout 2 more humorous romance, rather than in-depth and serious. It'll be interesting to see how Bethesda approaches that in Fallout 4." 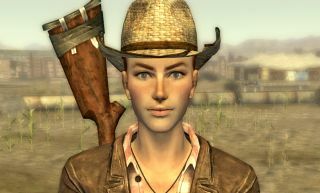 Obsidian considered a plotline where you'd, under the influence of alcohol, get married to Cass in New Vegas. Finally, I asked Sawyer what the likelihood was of Obsidian and Bethesda collaborating on another Fallout game or something different altogether. "Working with the Bethesda developers was really cool, they were very supportive with what we did and their technology actually made it very easy, relatively easy, to make the game. I mean, we made it in 18 months, which is kind of crazy if you think about it," said Sawyer. "I'd certainly like to work on another Fallout game in the future, but..." he said, shrugging, indicating that the future of Fallout is up to Bethesda.